Yesterday I was putting paint on a palette for my 3 year old. It was our first time painting together. He insisted on running his paint brush through all the colors at once to create these lovely multicolored brush strokes. (I won't lie, I did cringe as the palette lost separate definitive colors). As I type this, I realize that I love Thanksgiving because of the wonderful palette of flavors, especially in the side dishes. The sides are what provide all the color and beauty in the meal. As you are putting your menu together or deciding what to bring to a gathering, think color! 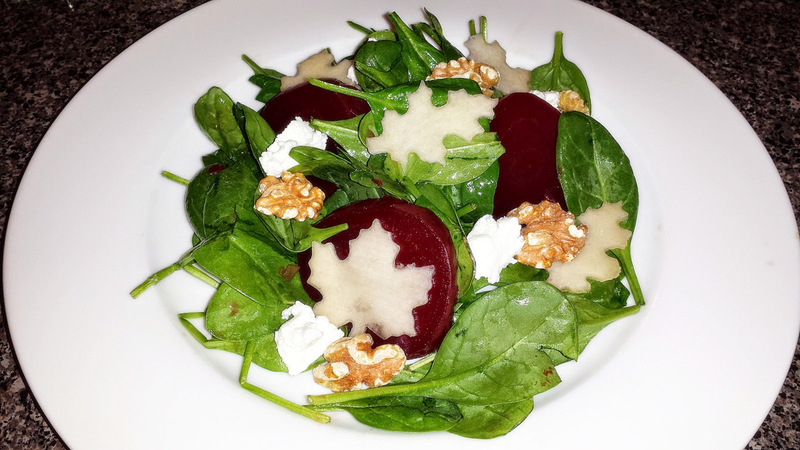 This pear, beet and spinach salad will be a great first course for your eyes and tummy. It is my favorite go - to fall salad because it is so simple. Preheat the oven to 350 degrees. Spread the walnuts single layer on a cookie sheet. Roast them in the oven till they smell nutty 8-10 minutes. 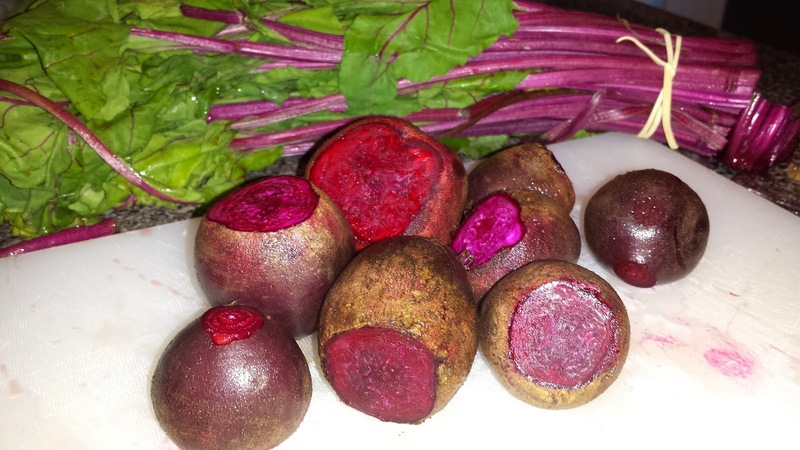 While the nuts are roasting, prep the beets. Cut the stems off, but do not peel. Then wrap them individually in tin foil and place them on a baking sheet. Bake at 350 degrees for 30-40 minutes, till you can insert a fork easily and pull it out. Cool and then peel the skin off and slice 1/8-1/4" thick. 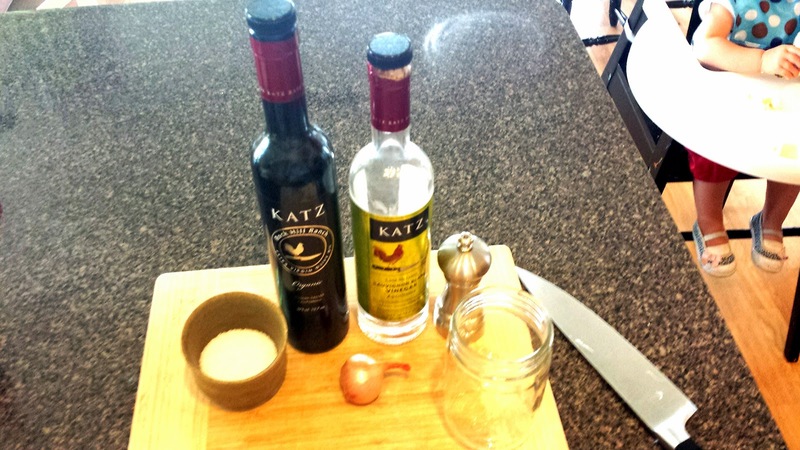 While the beets are roasting, prep the salad dressing. I like to use a pint sized canning jar for the dressing. I also like my dressings to be heavier on the vinegar, but that is where you can adjust to your personal preference. I probably do a 2:3 ratio olive oil to vinegar. First mince the shallot (like you would garlic), then sprinkle a generous amount of salt over it and let it sit for about 10 minutes. Add the vinegar, let it sit for 5, then add the olive oil and a dash of black pepper, shake vigorously. If you would like to keep the emulsion better, then whiz it in the blender with a few of your walnuts. Taste and add salt or vinegar as needed. Next slice the pears. I think all kitchens should have a mandolin. I have a very simple OXO that does the trick for simple things. 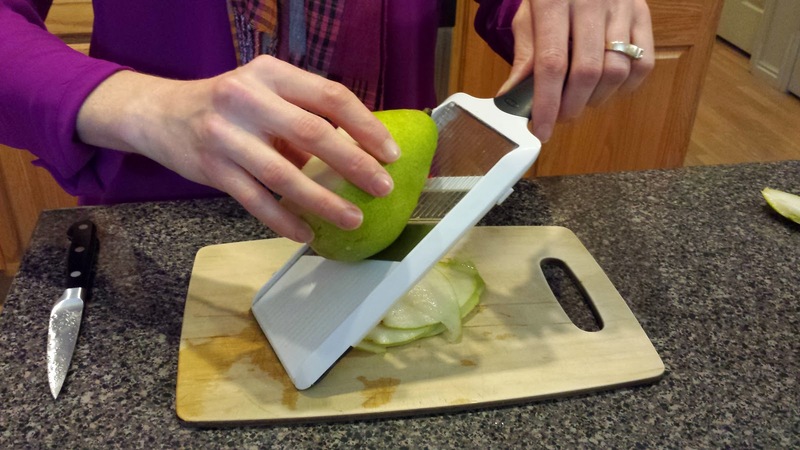 It slices everything the exact same thickness. After that, if you really want to get festive you can use your favorite shaped cookie cutter to add the perfect holiday touch. I recommend dressing any salad, just before you serve it. Toss the spinach with the dressing, then use that as a bed to display the beets, pears, goat cheese and walnuts. There are several nice variations you can do with this salad: pomegranate instead of beets, gorgonzola instead of goat cheese, or arugula instead of spinach. I love a beet salad. Can't wait to try this one.